The Witte Museum is located in San Antonio adjacent to the San Antonio River. 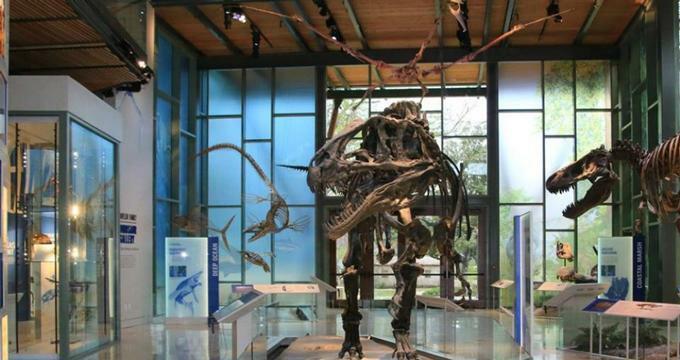 The museum is dedicated to Texas history and heritage, including the natural history and science of Texas. The H-E-B Body Adventure exhibit is in partnership with the San Antonio Mayor’s Fitness Council and is an interactive exhibit that teaches participants about health, wellness, and fitness. Guests partner with a virtual guide, who accompanies them through the exhibit in which they learn about several important markers of health and wellness such as heart rate. The Dinosaur Gallery offers visitors an Acrocanthosaurus skeleton and its 110-million-year-old footprints, which were found in the area. Displays of a giant crocodile skeleton and a Tyrannosaurus rex skeleton educate visitors about what the area may have looked like 90 million years ago, when San Antonio was on the shore of the Gulf of Mexico. The Texas Wild Gallery showcases the different ecosystems of Texas and the various plants and animals that live there. The gallery uses the museum’s historical dioramas alongside new technology to educate visitors. In the Live Lab, guests can see and even touch native Texas snakes and reptiles. Three art galleries house art depicting historical south Texas, including the George West Trail Drivers Gallery, which features artifacts and paintings memorializing those who built the cattle industry in the post-Civil War period. The People of the Pecos Gallery spans the entire second floor of the New Witte, and offers exhibits on the life and history of the native people of the Lower Pecos Canyonlands. Visitors may browse items in the permanent collection that are not currently on display by visiting the B. Naylor Morton Research and Collections Center. This innovative storage facility allows guests to access any item from the permanent collection by submitting a reference request form. History: The Witte Museum is named in honor of Alfred G. Witte, a San Antonio area businessman who donated $65,000 to the City of San Antonio in 1925 for the construction of a museum of art, science, and history. The funds were used to secure a permanent location for a natural history collection that had already been organized in 1923 by the founding members of the San Antonio Museum Association. The Witte Museum opened in 1926 at the site of the original irrigation canal that supplied water to the Alamo Mission and surrounding farms in the early days of San Antonio. The museum grew throughout the 1930s with both the San Antonio Art League and the San Antonio Conservation Society operating within its walls. The reptile program opened in the 1930s and became a great source of income for the young museum, with hundreds of visitors paying 10 cents each to see (and eat) rattlesnakes. A “modern” addition came in the 1960s, which increased the size of the museum by over 60%. In 1989, the San Antonio Museum split from the Witte, allowing the Witte to focus solely on Texas and regional art, history, and science. The 2000s ushered in a new era of growth, with a 20,000-square-foot addition known as the “New Witte,” which allowed for the expansion of programs and collections and for the display of the permanent collection in a state-of-the-art storage facility. Ongoing Programs and Education: Daily educational programs include everything from healthy cooking demonstrations to cowboy demonstrations on the uses of ropes and braids. Family Days offer hands-on activities and performances. The Louis A. & Frances B. Wagner Series offers special talks by curators and others about south Texas history, science, and art. Witte Museum Camps are offered over the summers and during spring break. These weeklong camps are themed around survival and living off the land, dinosaurs and paleontology, and weather and meteorology. Special events include Sunday outdoor jazz performances. Cocktails and Culture is a monthly event for adults that pairs a visit to the exhibits with food and drink. Culinary Nights at the Body Adventure exhibit pair chef talks with a multi-course dinner and wine. Past and Future Exhibits: Special exhibitions have included Whales: Giants of the Deep, an interactive exhibit that educates visitors about marine mammals, their evolution, and their role in human history, and Wild Weather, a look at extreme weather patterns and how scientists are working to understand them. What’s Nearby: The Witte Museum oversees the rock art paintings of the White Shaman Preserve and offers once-weekly tours to the site in the Lower Pecos Region.